A unique sonic mangler that would be a welcome addition to many a pedalboard. Freaky blend of powerful fuzz, filter, and tremolo effects. A little counterintuitive for those disinclined to tweak heavily. Despite the fact that Seymour Duncan has been designing stompboxes and effects for over a decade, most bass players only ever encounter Duncan’s wares in their hunt for an aftermarket pickup. Our guess is that the oddly-named Fooz will go far to broaden the brand’s pedal pedigree in bass players’ minds. Seymour Duncan calls the Fooz an ‘Analog Fuzz Synthesizer’, three words that, when grouped together, we find especially interesting given the direction our musical tastes are evolving in these days. Imagine our dismay, then, when we realized that there’s no synthesis lying within the pedal’s sturdy metal chassis. To be a true synthesizer, the Fooz would have to be capable of generating sounds of its own. It doesn’t do that. Rather, it offers a trio of effects and a variety of modulation sources in order to deliver a variety of synth-like sounds. The Fooz is a fuzz, filter, and tremolo pedal in one. Its synth-y character stems from the fact that many synth sounds make use of filters, amplitude envelopes, and LFOs to help shape sound. The Fooz Fuzz is also integral, since a fuzz pedal’s clipping action transforms audio into a square-ish wave, much like the square wave oscillator common to most synths. On the Fooz, the degree of clipping is controlled with the Gain knob, while the Level control is the pedal’s overall output. A small on/off switch engages the Duncan’s robust LFO- based tremolo, which offers players control over the LFO’s Depth, Speed, Wave, and Shape, which in this case is something akin to the LFO’s duty cycle. Also subject to LFO control is the Fooz’s switchable multi-mode (bandpass and lowpass) filter. Freq controls the cutoff, while Resonance adds amplitude at the cutoff, just like your average synth. A three-position switch is on hand to govern the filter’s modulation source between ENV (an onboard envelope follower with Sensitivity control) or the aforementioned LFO. If an expression pedal is attached to the provided 1/4” jack, it can be used to govern a number of parameters set by the rear-panel dipswitches. Importantly, the Duncan’s LFO can also be set via tap-tempo, thanks to a robust footswitch. 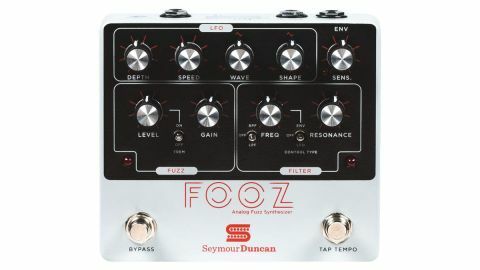 A comprehensive look at each of the Fooz’s many possible sounds is outside the scope here, but it suffices to say that Duncan’s latest design offers a multitudinous array of classic and exotic funky, fuzzy, and filtered sounds to players disciplined enough to find each parameter’s sweet spot. It isn’t an easy pedal to quickly grasp, though, so the less ambitious among you should look elsewhere. Its singular blend of tremolo, fuzz and filter is unlike anything on the market, and each effect’s interactivity makes serendipitous ‘woah’ moments a near-inevitability.